While critics of unbeaten pound-for-pound king Terence Crawford continue to demand better opposition, his fans continue to relish his every move in the ring. Apparently, both sides are tuning in whenever he fights. Crawford’s latest in-ring conquest—a 12th round stoppage of previously unbeaten Jose Benavidez Jr. last Saturday—produced a massive ratings win for ESPN, with the two-hour broadcast as a whole averaging 2.245 million viewers, according to Nielsen Media Research. The event—which aired live in front of a sold out crowd of more than 13,300 at CHI Health Center in Crawford’s hometown of Omaha, Nebraska—produced the second-most watched telecast of Top Rank’s boxing series on ESPN since returning to the network last July. Its debut—Jeff Horn’s controversial upset win over Manny Pacquiao—is the only show to outperform Saturday’s edition. Even more impressive was the fact that it came on a crowded sports night that saw college football on ABC—a primetime matchup between Top 15 teams Wisconsin and Michigan (6.038 million viewers)—improve by more than 150% over the same slotted event one year ago. Crawford-Benavidez Jr. also competed against live coverage of Major League Baseball playoffs, which at 5.821 million viewers was within 10% of its lofty rating exactly 52 weeks ago. The positioning of Saturday’s main event came with a strong college football lead-in of its own. Top-rated and defending champion Alabama’s rout of Missouri drew 3.758 million viewers in a game that ended early enough for ESPN to enjoy a rare on-time start for a primetime boxing event. For Crawford, it’s more than a 230% increase from his previous ESPN primetime appearance, ironically in a far more significant bout. The undefeated switch hitter’s 3rd round knockout of Julius Indongo last August—which made him the first-ever four-belt champion in the history of the super lightweight division—averaged 965,000 viewers over the course of the telecast, with the bout itself averaging nearly 1.3 million viewers. Specific ratings for each of Saturday’s two-bout telecast were not immediately available. The show also featured unbeaten featherweight Shakur Stevenson—a 2016 U.S. Olympian who earned the silver medal in the Rio Olympics—in a career-best 1st round knockout of Viorel Simion, who’d previously never been dropped or stopped. According to an ESPN press release over the weekend, overnight ratings landed both legs of the doubleheader as the most watched boxing bouts of 2018. Crawford-Benavidez pulled in a healthy 1.8 overnight rating, slightly more than 80% above that of his pound-for-pound rival and promotional stablemate Vasyl Lomachenko, whose historic off-the-canvas knockout win over Jorge Linares this past May pulled a 1.0 overnight and just over 1 million viewers overall. 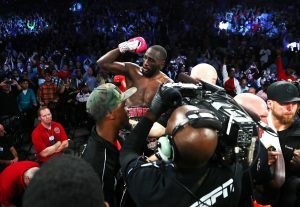 Saturday’s win marked the first successful defense of the welterweight title for Crawford (34-0, 25KOs), who won the belt in a 9th round stoppage of Horn this past June. That bout aired exclusively on ESPN+, a decision mandated by the ESPN brass that never seemed to sit well with Crawford and his team. Ever the soldier, Crawford accepted the terms and ran through Horn in collecting a major title in his third weight class. His run as undisputed super lightweight champion was preceded by a 2014 Fighter of the Year-level campaign that bookended his stay as lightweight champion before moving up in weight. The first defense of his welterweight title came with harsh pre-fight criticism, and for good reason. The 147-pound division is overflowing with top level talent, but Top Rank’s desire to keep the title defense in-house saw Crawford as high as a 33-1 favorite over Benavidez, a gifted amateur back in his day but who has managed to squander any positive momentum in the pro ranks. Still, the previously unbeaten boxer from Phoenix, Ariz.—who held an interim title at 140 pounds—was praised for his brave return to the sport after being shot in his left leg in 2016. The 26-year old—whose younger brother David is a currently unbeaten super middleweight titlist—made his comeback earlier this year, a pre-Super Bowl event on ESPN in Corpus Christi, Texas for which Crawford was in attendance. Benavidez Jr. planted the seeds for a budding rivalry, getting into a heated exchange with Crawford and continuing the verbal onslaught throughout the year. Benavidez Jr. appeared on the undercard of Crawford’s aforementioned win over Horn in Las Vegas this past June, scoring an 84-second knockout of previously unbeaten Frank Rojas. From there, the trash talk only increased, reaching a boiling point when the two landed in a brief violent eruption during Friday’s weigh-in. To his credit, Benavidez Jr. gave a decent account of himself at least through the first half of Saturday’s main event, but was limited to taunting and absorbing over the final six rounds. Crawford finally decked his heated rival in the final minute of the fight, with an ensuing onslaught prompting referee Celestino Ruiz to stop the contest with just 18 seconds left. The end result sparked a boisterous response from the partisan crowd on hand, which served as the largest attendance for any of Crawford’s five main events in this building and six overall title fights in his home state of Nebraska. A hard-line stance is being taken by media members for Crawford’s 2019 campaign to include a mouthwatering showdown with fellow unbeaten welterweight titlist Errol Spence. Momentum for such a fight will only continue to build—much like Crawford’s fan base, as evidenced the numbers produced at the box office and in the ratings this past weekend.